In this review we compare Bigcommerce vs Squarespace, to try to help you establish which platform is better for your business. We'll go through the pros and cons in depth and highlight why you might wish to use one product over the other. Note: in this comparison we are discussing the 'standard' verison of Squarespace, aimed at general users, not the developer's platform. Online publication, or online store? Before plumping for either of these platforms you need to work out what you’re trying to build — an ‘online publication’ or an ‘online store’. The reason why it’s worth taking some time to figure this is out is because both Bigcommerce and Squarespace started out life with different raisons d’êtres: Squarespace was initially conceived as an elegant / easy way to publish content; and Bigcommerce was conceived as a straight-up selling tool. In recent years, both platforms have sort have morphed into each other a bit – the addition of e-commerce functionality to Squarespace means it’s now got a foot squarely planted on Bigcommerce’s turf; and the addition of blogging functionality to Bigcommerce has resulted in it developing into a tool that can technically be used for publishing content. Despite the increasing similarity of both tools however, my take on them is that they still serve two rather distinct audiences: users who are more concerned with publishing content regularly – and laying it out in an attractive manner – would generally be wiser to gravitate towards Squarespace; and those who have more advanced selling requirements would be better off with Bigcommerce. Let’s do a head-to-head on their pricing and key features though, so that you can make your own mind up. Discounts for all the above are available if you pay annually - the monthly fees for the above plans work out respectively at $12, $18, $30, $40 when you pay upfront for a year's service. If you pay upfront for a year's Bigcommerce service, and you’re buying a ‘Plus’ or ‘Pro’ plan, you can avail of a 10% discount. All Bigcommerce plans permit you to sell an unlimited number of products. With Squarespace, the 'Business', 'Basic' and 'Advanced' plans also permit you to sell an unlimited number of products, but the 'Personal' plan doesn't provide any e-commerce functionality at all. The good news for users of Bigcommerce is that there are no transaction fees to worry about (i.e., the company will not take a cut of your sales revenue). You can avoid transaction fees from Squarespace too, so long as you are on one of their two most expensive plans ('Basic' or 'Advanced'). If you're on the 'Business' Squarespace plan, you will be charged 3% transaction fees respectively. However, with both products you will need to choose a payment gateway. This will involve working with a third-party company that will take a cut of your sales. Let's take a look at the options. A payment gateway is a service that you essentially ‘plug in’ to your website to accept online payments. This is an area where using Bigcommerce is significantly better than Squarespace - it works with around 40 payment gateways, whereas Squarespace works with just two: Stripe and Paypal. Let's look at the Squarespace options first. Because of it's ubiquity and large userbase, Paypal is a very useful payment gateway to be able to integrate into your site. It also doesn't involve any monthly fees. Stripe fees also vary according to the country you are selling from. To give you rough idea however, in the US the Stripe credit card fees are 2.9% + 30c per transaction. In the UK, a more reasonable 1.4% + 20p rate is charged when European cards are used, and 2.9%+20p for non-European cards (for now — let’s see what happens after Brexit!). It's worth noting that you can only use the full version of Stripe if you are based in certain countries – i.e., you can sell your products to any user in any country worldwide with Stripe but you can only do so from the countries supported by the company. As things stand, you can sell from 26 countries using Stripe (these include the US and several big EU member states). If you don't live in a Stripe-supported country and want to sell with Squarespace, your only option is to use Paypal as your payment gateway. It's easy to integrate either Paypal or Stripe into your Squarespace account. With Bigcommerce, you can use around 40 different payment gateways, so this means you can shop around to a degree to find the best deal when it comes to transaction fees (note however that not all payment gateways are available in all countries - how many you can use will depend on where you live). There may be a bit of configuration work involved in integrating your chosen payment gateway into Bigcommerce, but generally speaking this won't involve much time or effort. Using this option means a bit less hassle when it comes to setup. One important thing to note about Bigcommerce when it comes to pricing is that the product has a 'maximum annual online sales' limit; depending on the plan you plump for, you will have to pay extra if you are fortunate enough to exceed certain sales limits. This contrasts negatively with Squarespace, where no such limits apply. I wouldn't describe it as a show-stopper — to be honest, if your sales are in the region of $150,000 per year you are not really going to quibble over a few hundred dollars. But that said, it is worth pointing out that Bigcommerce seems to be fairly unique amongst online store building products in applying these fees. So which is cheaper, Squarespace or Bigcommerce? It's a case of swings and roundabouts; a big fat case of 'it depends'. You can start selling slightly cheaper with Squarespace, on its $26 'Business' plan. However, the transaction fees are high on this plan — so, depending on your sales figures, this may be a false economy. You can avail of real-time carrier shipping quotes cheaper with Bigcommerce - it's available on its cheapest plan (the $29.95 Bigcommerce Standard option). By comparison, you need to be on the most expensive $46 per month Squarespace plan to obtain this. You can avail of abandoned cart recovery functionality (which can boost revenue significantly) more cheaply with Squarespace — it's available on the $46 monthly plan. By contrast, you'll need to be spending $79.95 with Bigcommerce before you can get your hands on similar functionality. But pricing, as ever, is not the sole consideration to base your decision on. Let's look at some features. There’s no doubt about it: Squarespace offers the better-looking templates: they are beautiful and represent their strongest selling point. That’s not to say that Bigcommerce’s are at all bad — they’re just not quite as slick as Squarespace’s offering. There are also far fewer to choose from: Bigcommerce only provides 7 free templates, whereas Squarespace offers 22 ‘families’ of templates, with most family containing a few variants of each template. Bigcommerce does however provide a wide selection of paid templates: there are 120 themes available to purchase, which vary in price from $145 to $235 (occasionally, when there’s a sale on, you can pick one up for $99). I have couple of cautionary notes about both sets of templates. First, I would argue that within the range of free and paid-for Bigcommerce themes, there is not a huge degree of the variety between templates — a lot of differently named templates look very similar. And because Squarespace is a product which is focused at a much wider range of users than Bigcommerce - photographers, bloggers, bands, artists, restaurant owners etc. - a lot of the templates are not really of the 'online store' variety. Accordingly, there are just a few dedicated online store themes available in Squarespace. That said, you can sell using any of them, but if you plump for say, a Squarespace template that is designed with photographers in mind, you may find it slightly harder to use it as the basis for building an online store. This variety of purposes behind the Squarespace templates arguably reinforces the whole "Squarespace for content, Bigcommerce for an online store" vibe discussed at the start of this review. In terms of editing, both Squarespace and Bigcommerce provide a style editor — a set of controls that allows you to tweak colours, typefaces and other aspects of the design. Squarespace makes it it harder to edit the code behind the templates — although it is possible on the 'Business' plan and higher to add custom CSS to Squarespace sites, the company don't really like you doing this (and may restrict their support offering somewhat if you do). In terms of adding HTML, it is possible to add 'code blocks' to Squarespace sites, although not on every type of page ('cover pages', for example, don't support this). So long as you are on a Squarespace ‘Business’ plan or higher, you can also inject code to the header and footer of every page, which does open up quite a lot of configuration possibilities to those who are familiar with coding (note that code injection is only permitted on Squarespace 'Business' plans and higher, however). Bigcommerce gives you full control over HTML and CSS, making it technically the more flexible solution on this score. If you are an experienced developer however, or you know one, then using Squarespace developer's platform can be used to configure Squarespace sites in a more bespoke manner. Both Bigcommerce and Squarespace are pretty straightforward to use, and their interfaces are relatively similar, in that you have a menu on the left which you can use to access key functionality, and an area on the right which can be used for uploading/editing content and products or viewing data. The best thing about Squarespace's interface is its drag and drop style ‘layout engine’ which is really fantastic for organising and showcasing your content in a variety of ways. However it can be a bit sluggish at times, and crashes a bit more often than I'd like. 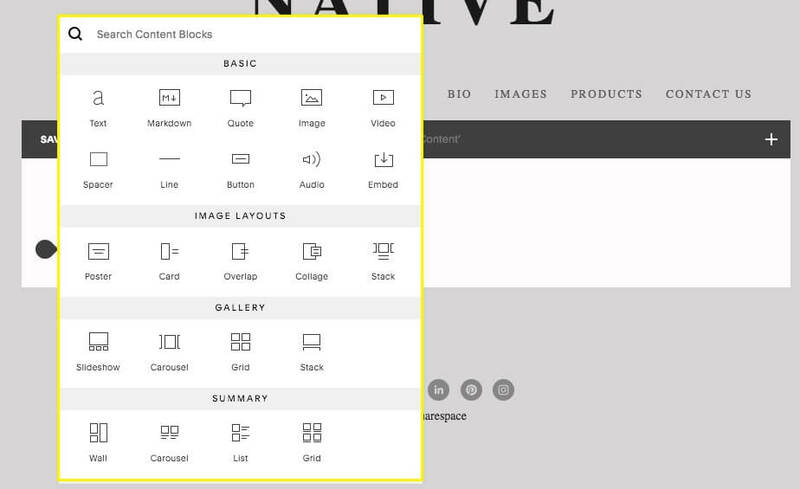 Laying out content in Squarespace is very easy, thanks to its ‘content block’-based interface. Bigcommerce's interface is now very similar to Shopify's; it's clutter-free and arguably a bit more responsive than the Squarespace one. It is not as flexible as Squarespace’s when it comes to laying out text and images — but then again, that's because it's primarily an online store builder, not a publishing platform. In terms of blogging functionality — very important for inbound marketing or content marketing applications — both platforms let you blog out of the box, which is great. Squarespace’s blogging functionality is definitely better than Bigcommerce's however. First, it is far more flexible when it comes to how you present your blog content. You can drop blog content easily onto any section of your site your site, using lovely ‘magazine blocks’ and ‘featured posts’ widgets. These allow you to pull (and filter) text and images from your blog posts and display them in a variety of attractive ways. Bigcommerce doesn’t let you do that — the best you’ll get is links to your blog articles on your site footer. Squarespace also provides RSS feeds for its blog posts (these can help your content appear on other sites, or power automated emails); Bigcommerce’s blog, somewhat inexplicably, doesn't facilitate RSS feeds. A key difference between Bigcommerce and Squarespace is that Bigcommerce has an app store that you can use to purchase integrations with other apps; Squarespace doesn’t. Bigcommerce’s app store contains around 600 integrations with other platforms; additionally, it contains apps which have been developed to add specific pieces of functionality to Bigcommerce stores (covering everything from data capture to dropshipping to label printing). All these can be integrated with a few clicks in Bigcommerce; you generally don’t have to worry about inserting or tweaking code when you use them. There isn’t an equivalent Squarespace app store, but that's not to say that you can't integrate other apps with Squarespace — you can. There are a few 'official integrations' available out of the box with Squarespace (available on the 'Business' plan and up) - these include Mailchimp, Xero, Dropbox, OpenTable, Soundcloud, Twitter and several others. For anything else, you can either embed code from other apps into your Squarespace site using a code block, or use Zapier to connect Squarespace's forms to other apps. For bespoke functionality, you can code something yourself, or buy some third-party code snippets which are increasingly referred to as ‘Squarespace plugins.’ (We now offer quite a few of these - check out our Squarespace Plugins store to view). Many online retailers also take their business out into the 'real world' occasionally - for example, selling product in physical locations such as retail outlets, markets, events and so on. This requires your online store platform to be able to work at 'point of sale' (POS). A typical POS scenario would be where you want to use a card reader in conjunction with your online store system to take payments or email or text receipts to somebody who's just bought something from you in person. Bigcommerce is definitely the better option here, because it integrates with several platforms — Square, Shopkeep and Springboard Retail — to provide this functionality. Bigcommerce supports official integrations with point-of-sale hardware provided by companies like Square; Squarespace does not. Squarespace has yet to provide a POS option, so if you're thinking of selling goods in person but want to do this via your online store platform, then Bigcommerce is definitely the better option of the two. Many people who get involved with e-commerce do so because they want to start dropshipping products. Dropshipping is a method of selling online where you don't keep what you're selling in stock — rather, you take an order, send it to a supplier, and they deliver the goods to the client. Your online store, in effect, becomes a middle man for another business. If you're interested in starting a dropshipping business, then Bigcommerce is a better bet than Squarespace. With Bigcommerce there are a quite a few dropshipping apps available to help you source and sell inventory; but there's no easy equivalent way of dropshipping in Squarespace. (The only way that I can think of dropshipping using Squarespace it is by using an e-commerce platform like Bigcommerce, Shopify or Ecwid to host your collection of dropshipped products, and then embedding them onto your Squarespace site using a code snippet. Doable,but not ideal, as you end up running two separate platforms). An area which is handled significantly better by Bigcommerce than Squarespace is search engine optimisation (SEO). First, Bigcommerce refers to the core SEO elements by their proper names; this is always not the case with Squarespace. In Bigcommerce, you're dealing with titles, meta descriptions, alt text — all the proper SEO terminology you'd expect. By contrast in Squarespace you often encounter things like 'captions', 'descriptions' and 'excerpts' — all of which can be used for SEO purposes but depending on the content type and template used, can also end up visible on your website. Second, creating 301 redirects (which notify search engines that the URL of a page has changed and to update their serach results accordingly) is a simpler affair in Bigcommerce. The interface for doing so is easier to use than the Squarespace equivalent, and you can also use it to create ‘dynamic’ redirects, which will update themselves to reflect any future changes to location of the page that you’re creating the redirect for. Thirdly, Bigcommerce integrates AMP — accelerated mobile pages — better. AMP is a format which massively speeds up delivery of web pages on mobile devices, something which can boost performance of a website in search results; although you can use AMP with Squarespace, it’s limited to blog pages. Bigcommerce, by contrast, allows you to use AMP on any page type (depending on template: AMP is facilitated on all the free Bigcommerce templates, and a selection of the paid ones). Finally, Bigcommerce allows you to create a simpler and ‘cleaner’ URL structure for products — something which Google prefers. In Bigcommerce, you have total control over the format of your URL, but Squarespace product and blog post URLs always involve a prefix (of ‘products’ or ‘blog’ respectively). For a more detailed overview of Squarespace and Bigcommerce search engine optimisation features, you might like to check out our Squarespace SEO and our Bigcommerce SEO guides. Both Bigcommerce and Squarespace allow you to add a ‘review product’ option to your store items. However, with Bigcommerce this functionality is built in – on Squarespace you will need to use a third-party tool (which might not be a bad idea if it’s something like Disqus). One really nice feature of the Bigcommerce reviews and ratings tool is that after a user buys a product, they’ll automatically receive an email a few days later asking them to review it. If editing your site or store on a mobile app is important to you, then you should be aware that none exist for Bigcommerce. Of the above options, most users will probably appreciate Squarespace’s 'Blog' and 'Commerce' apps the most, as these allow you to publish blog content and manage e-commerce orders on the go. Squarespace’s “Blog” app - Bigcommerce doesn’t provide any mobile apps at all. 'Analytics' is useful too and does what you might expect it to: look at your site stats on a smartphone. 'Portfolio' allows you to download the content of your Squarespace galleries to your mobile device so that you can show people your images on it when you don't have access to the web. The ‘Squarespace’ app is a new addition to the range of mobile apps provided by Squarespace. At the moment it allows you to edit content and manage comments on your site (note that it doesn’t seem to cater for e-commerce yet; I suspect however that in time it will). Ultimately Squarespace offers more comprehensive — and official — options when it comes to managing your store on a mobile device, so a definite win for Squarespace here. Bigcommerce is a winner when it comes to support – it provides more methods of contacting the helpdesk, and crucially, offers phone support, which Squarespace doesn’t. Both platforms make you jump through a couple of hoops before they will let you view the contact details for their support team — you are encouraged to submit your question via an online form and review potential answers before relevant contact information is displayed. Helpfully however, Bigcommerce provides a handy 'skip this step' option, which allows you to see the contact details more quickly. With Bigcommerce, as soon as you sign up, you will get contacted via phone and email by one of their support staff seeing if they can help you set up your store (read: convert you to a paying customer). Not every user will love this (some will find it a bit intrusive) but for those who do want a bit of hand-holding when setting up their store, it can be helpful. Which is best, Bigcommerce or Squarespace? As discussed at the outset of our Bigcommerce vs Squarespace comparison, the answer to this question boils down to what you want to do: showcase content or run an online store. If you’d like to start an online magazine, publish a blog, run a band website or host a photographic portfolio – but maybe sell a few products on the side – you are probably going to be better off with Squarespace, as its templates (aesthetically speaking) are arguably better than Bigcommerce’s and easier to present content with. The blogging functionality is better too. However, if selling goods is your primary objective, then Bigcommerce is nearly always the better bet. With more options around payment gateways and a wide range of other tools focussed specifically on selling goods in general, Bigcommerce is a better platform for ‘power’ online store users and is the more professional e-commerce solution. Its SEO features in particular are significantly better than the Squarespace equivalents, making it easier for you to drive traffic to an online store once it’s live. It provides more advanced selling features. It comes with considerably better SEO features. It offers a significantly wider selection of payment gateways. Bigcommerce provides point-of-sale functionality and integrations; Squarespace does not. Phone support is provided on all Bigcommerce plans. You can use AMP on any page type in Bigcommerce; Squarespace limits this to blog posts. Reviews and rating functionality is built in. An app store is available which helps you extend the functionality of your website. Dropshipping is significantly easier to do in Bigcommerce. A larger selection of free templates is included with Squarespace, and aesthetically speaking, they are usually stronger than the Bigcommerce equivalents. The Squarespace interface makes it easier to lay content out the way you’d like to. Squarespace’s blogging functionality is stronger, and includes RSS feeds. You can start selling products slightly cheaper with Squarespace. You can use dedicated mobile apps to manage your store with Squarespace; none are available for Bigcommerce. No sales limits apply on Squarespace plans. Abandoned cart saver functionality is cheaper on Squarespace. Both Bigcommerce and Squarespace offer 14-day free trials of their product. For more resources on e-commerce and running an online business, make sure you join our mailing list. Subscribers receive key tips on building websites and online stores (covering everything from platform selection to inbound marketing to SEO) as well as receiving discount codes for industry leading apps. You can subscribe for free here.